Flair Showcase. 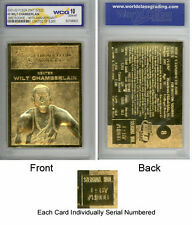 This gold version was made by Fleer and was limited and numbered of only 25,000. 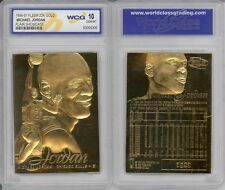 About Gold Cards :A skilled artisan hand inscribes a detailed portrait of the superstar in raised relief on a steel die. BOSTON CELTICS #33. LARRY BIRD. PLAYER : Larry Bird. About Gold Cards : A skilled artisan hand inscribes a detailed portrait of the superstar in raised relief on a steel die. This die is then used to strike thin sheets of paper-backed 23kt gold foil. 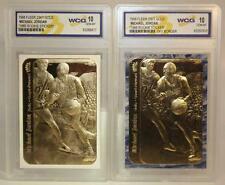 It is a very sought after card by all Jordan collectors. 100% authentic and original. 10th Anniversary Fleer Rookie Cards - Graded GEM-MINT 10. • 1996-97 10th Anniversary Rookie Cards. • Professionally Graded Gem Mint 10. Ben Simmons, KAT, etc. • 5 inserts possibly numbered, No Junk, all stars and rookies, LeBron, Jordan, Simmons etc. Also sequentially numbered HOF's! •And of course a chance for one of the Chasers listed, or others such as Booker, IT4, Curry, etc.! NOTES: Sculptured 23KT Gold Card. CONDITION: Gem Mint 10. YEAR: 1997 (1986). If you buy 1, then you get 2 total. If you buy 2, then you get 4 total. If you buy 3, then you get 6 total and so on. 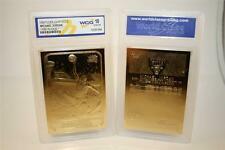 We carry a full line of gold cards consisting of all types. No Gimmicks, No Hassels, No Tricks! This gold version was made by Skybox and was limited and numbered of only 5,000. It is the most rarest Allen Iverson Rookie ever produced. PLAYER : Allen Iverson. About Gold Cards : A skilled artisan hand inscribes a detailed portrait of the superstar in raised relief on a steel die. BGS 10 Pristine. Corners 10. Surface 10. You are getting the card listed in the title and seen in the picture(s). Freshly Graded 2019! The card in the photo is the actual card you will receive. BGS 10 Pristine. Centering 10. Surface 10. _gsrx_vers_841 (GS 7.0.16 (841)). BGS 10 Prostine. Centering 10. Corners 10. _gsrx_vers_841 (GS 7.0.16 (841)). 2018-19 Panini Prizm Jared Jackson Jr BGS 10 Pristine Emergent #4 RC Wow Tough! BGS 10 Pristine. Centering 10. Corners 10. Surface 10. BGS 10 Pristine. Centering 10. Corners 10. _gsrx_vers_841 (GS 7.0.16 (841)). You are buying the card listed on the title only. FRESHLY GRADED! SET CARD 289. #403 Leather. BGS 10 Pristine. Centering 10. Surface 10. CONDITION: Gem Mint 10. YEAR: 1997 (1986). PSA 10 2018-19 Panini Prizm LUKA DONCIC Rookie Mavs RC. Condition is Like New. Shipped with USPS First Class Package. KOBE BRYANT ROOKIE (LOS ANGELES LAKERS-GUARD) 1996-1997 UPPER DECK UD3 JAM MASTERS ROOKIE CARD#19 GRADED BCCG10 MINT OR BETTER GRADE! IT IS MINT OR BETTER CONDITION SINCE IT WAS GRADED BCCG10 BY BECKETT GRADING SERVICES (0001000837)! 2008-09 Russell Westbrook Bowman Chrome Xfractor Refractor RC Rookie /299 PSA 10! (N1) **Check our my Lebron Rookies, Donovan Mitchell, Jayson Tatum, Embiid, Ben Simmons, Durant, Curry, and all the tops Stars! #GL1 Chicago Bulls. concerning anything I have listed. 2003 SAGE PANGOS DWIGHT HOWARD ROOKIE. Graded: WCG 10 - Gem Mint. Limited Edition to 10,000 cards.Features Dwight Howard: Senior @ SW Atlanta Christian High School.